This popular french recipe features an all-time “powerhouse” of nutrition. 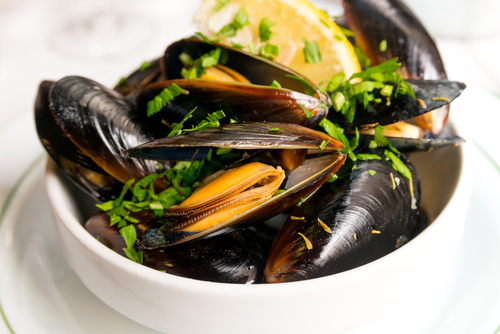 Mussels are an excellent source of quality protein, vitamin B12 (known to prevent Alzheimer’s disease), iron (plays critical role within cells assisting in oxygen utilization), zinc (keeps brain function strong and plays a leading role in weight loss) & selenium (a powerful booster of heart health). Place mussels in a large bowl with cold water to cover. Let them soak for about 20 minutes to remove any dirt or sand and then rinse. Heat olive oil in a large stockpot over medium-low heat. Add garlic, and saute for one minute. Add the chopped onions and cook until almost tender. Pour in the white wine, and stir in the parsley, thyme and butter. Bring to a boil, and allow to boil until the liquid has reduced by half, about 15 minutes. Season with salt and pepper to taste. Add the mussels to the pot, put the lid on and allow the mussels to steam for about 5-6 minutes, lifting the lid from time to time to check – you will know they are cooked when the shells have opened. Discard any mussels that remain closed. Transfer the mussels and sauce to a large serving bowl, discarding any unopened shells.